The internet has transformed the way that businesses market themselves, but it has not made older tactics obsolete. In fact, many offline marketing methods are more tangible and more personal than their digital counterparts, making this a great way to stand out and build a stronger connection to your customers in an age when many of your competitors will neglect these promotional avenues. Promotional merchandise, in particular, is a powerful way to connect with customers and clients and bring in new business. One of the big problems with marketing of any kind is getting people to pay attention. Even raising awareness by having them remember the name of your company is a win, but too often advertising is ignored entirely. According to research, however, giving out promotional products leads to 62% of recipients remembering your business' name and key information. This is a much bigger boost to brand awareness than most alternatives can hope to deliver. Done right, giving away promotional merchandise can be an excellent way to engage with communities. This, in turn, is a powerful method for raising your business' profile and building a positive reputation. Offering branded merchandise to community groups, charities, sports clubs and the like can be a great way to promote your brand and improve its overall image while simultaneously helping out good causes. Giving merchandise away outright can be a practical and effective alternative to simply offering discounts on your products, and can actually be more cost-effective over time. Discounts only drive sales when they are in place, so to provide long-term effectiveness they must be offered regularly and repeatedly. Unfortunately, customers as a group are quite good at catching on to this and adjusting their price expectations. Giving out promotional merchandise, on the other hand, still serves as an effective promotional strategy without cheapening the perceived value of your products and services. The promotional products you give away can help craft a specific brand image, or at least help you to shape certain aspects of the way your brand is perceived. For example, giving away branded, recycled notepads or fairly-traded promotional confectionery can lead people to view you as a responsible company. Alternatively, things like pens, T-shirts, pens, and more general items of confectionery come with little or no loaded connotations, leaving a brand image you are already happy with essentially untouched while still serving as a highly effective promotional strategy. You purchase promotional products in bulk at wholesale prices. Your customers, on the other hand, are used to having to buy these things at retail prices. As such, there is an imbalance in your favour between the price you pay for this merchandise and the value it has to your customer. More promotional value has been received than your business has actually spent on the merchandise in question, and the effectiveness of this promotional strategy is boosted accordingly. In a sense, there is an effective built-in profit in the value you get over the money you have spent. Distinctive Confectionery was established over 20 years ago and is owned and managed by Tegwyn and Adele Thomas, a husband and wife team, together with their dedicated staff. Distinctive Confectionery offers a wide range of both chocolates and confectionery. 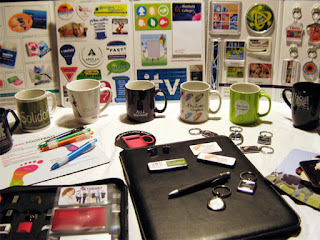 Promotional and Corporate Gifts are some of the most important parts of doing business anywhere. Interesting read. Promotional products have continuously gained in popularity over the years!